Biographical drama following the life of Queen frontman Freddie Mercury (Rami Malek). When relatively unknown English band Smile discover young singer Freddie Mercury just at the time their frontman walks out, everyone's hopes lift as they finally find the sound they had been missing. Changing their name to Queen, the band become determined to get their music on the radio but find the task increasingly difficult. When they realise their ambitions of becoming a successful band, Freddie shocks everyone by expressing an interest in a solo career. 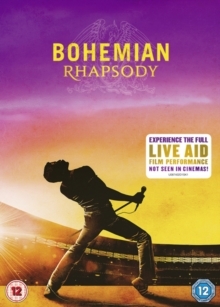 As they are invited to perform at the charity Live Aid concert, will Freddie return to his roots and the band that made him famous or will his AIDS diagnosis stop him from performing? The cast also includes Ben Hardy as Roger Taylor, Gwilym Lee as Brian May and Tom Hollander as Queen manager Jim Beach.